Happy Monday everyone! For us Canadians, it’s Thanksgiving so Happy Turkey Day to my Canadian followers. This next look I like to think of as boho work chic. 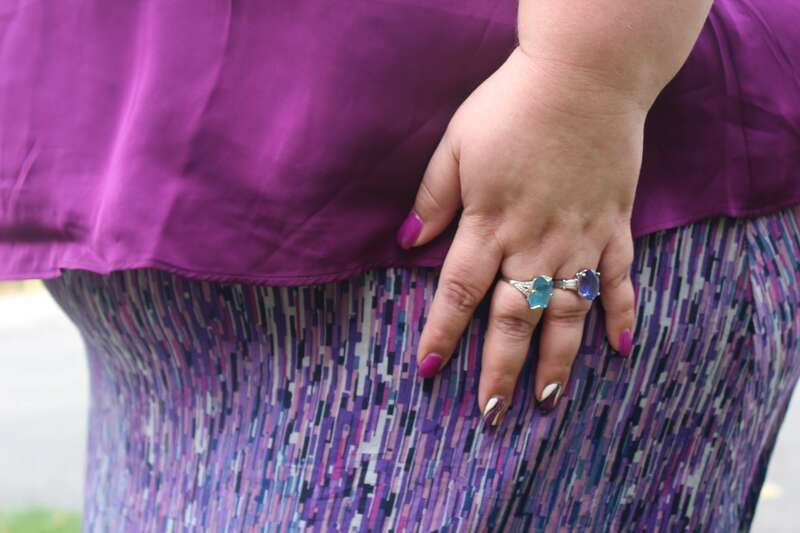 It features my two absolute favourite colours – purple and teal. I love them on their own and together. 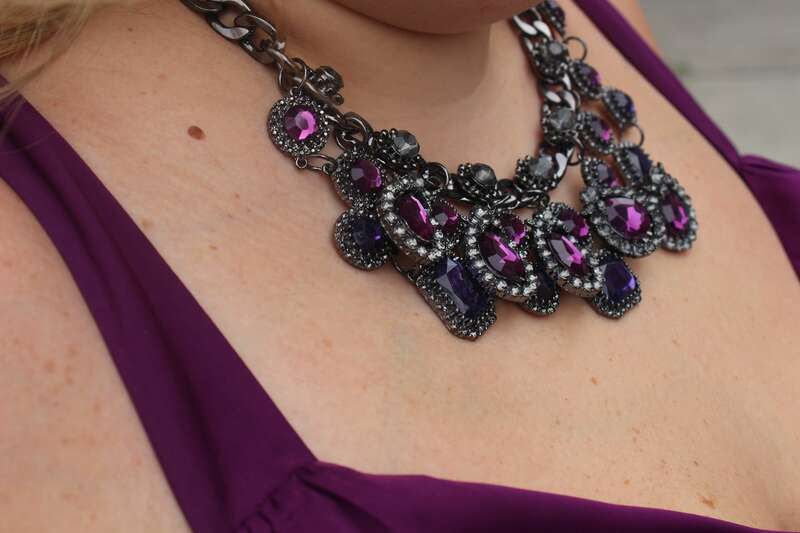 And the richness of this purple is simply ah-mazing! 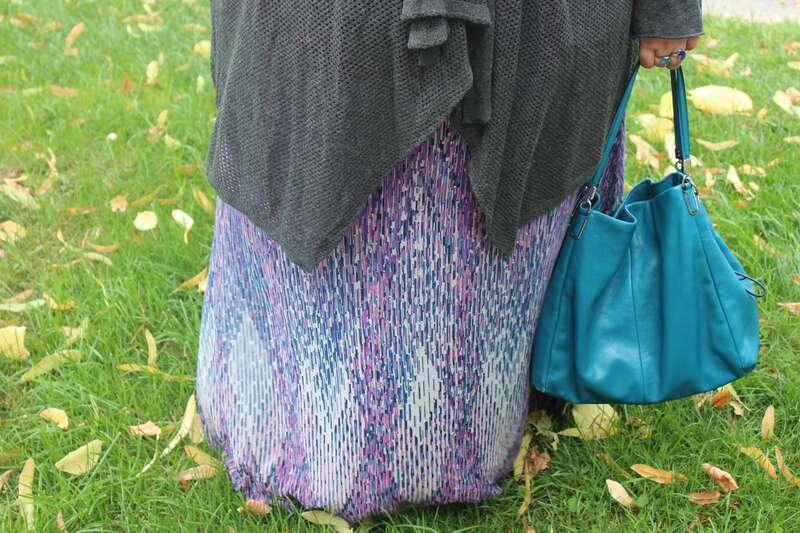 I love maxi skirts and dresses but you typically only see them in the summer. 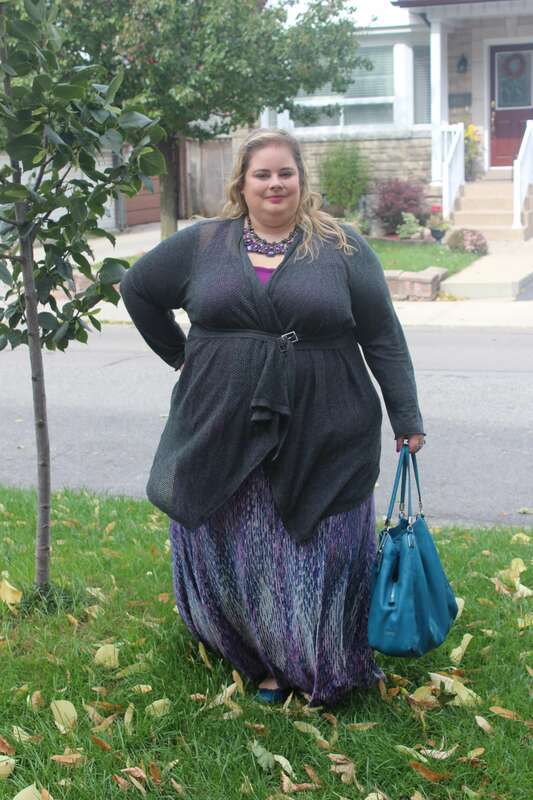 But when the fall collections started coming out I was thrilled to see that maxis are still hot for fall. It is a great option for these transition months where the weather can’t make up it’s mind and it’s varying degrees of hot and cold. And the prints and colours have been phenomenal. 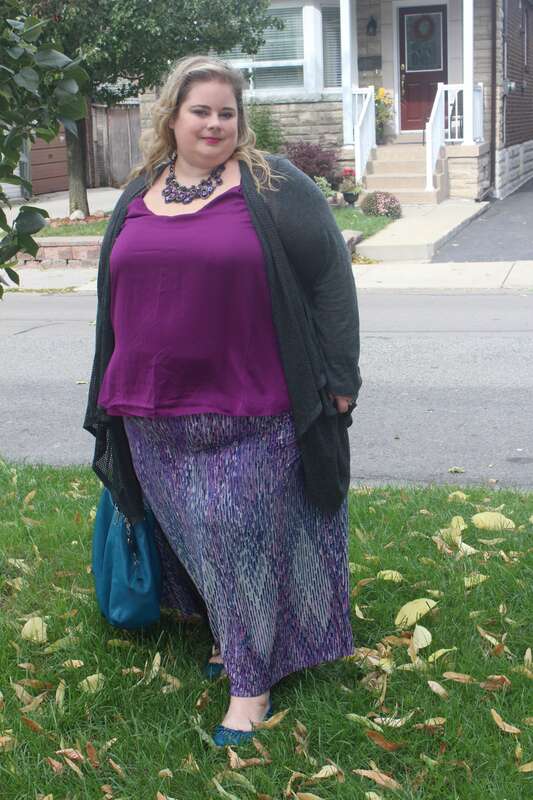 This skirt is from Lane Bryant and is made of a super soft and comfortable jersey fabric in this amazing diamond print pattern with shades of purple, teal, grey and black. It has a thick comfortable elastic waist band for all day comfort and being 5’6 it’s not too long, I can wear it with flats. I have to say the pictures on the website do not give the richness of the colour palette justice. So when I picked it up in store I was even more thrilled. 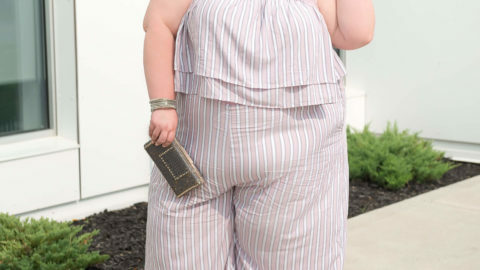 This is a true to size LB piece, I am wearing the size 26/28. I like to layer in the fall and winter because I am a gal who is always hot, especially at the office. I have a fan going at my desk pretty much 365 days a year, lol. And yes, we have air conditioning! So I need to be able to take off a layer while at my desk but then put it back on if I have a client meeting for example. 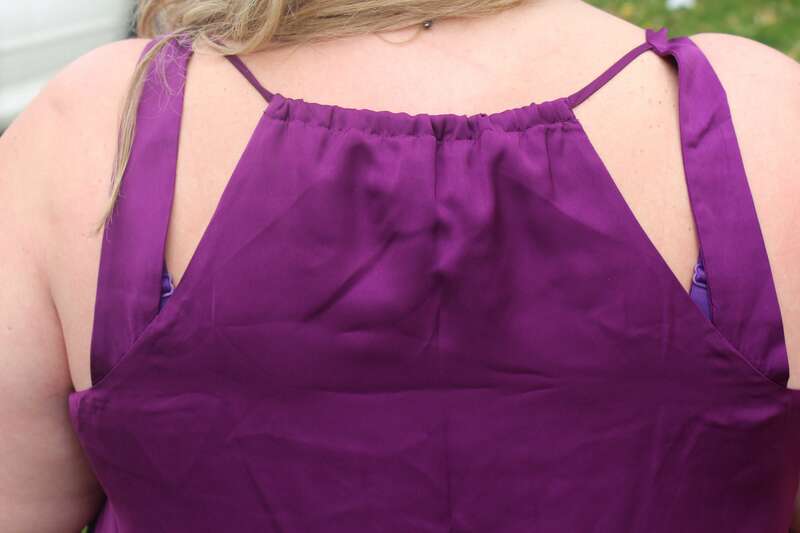 I chose to pair this skirt with this 6th & Lane tank in this glorious shade of plum. This tank is made of satin and the fabric is so soft and luxurious. I was nervous ordering it because I usually have problems with blouse like tops that have no give in the fabric due to my pear shape. This one is perfectly flowy on me though. I am wearing the size 28. I love that the straps are wide enough to cover your bra. The cut outs in the back are unique and add an interesting touch. And you still couldn’t really see my bra. 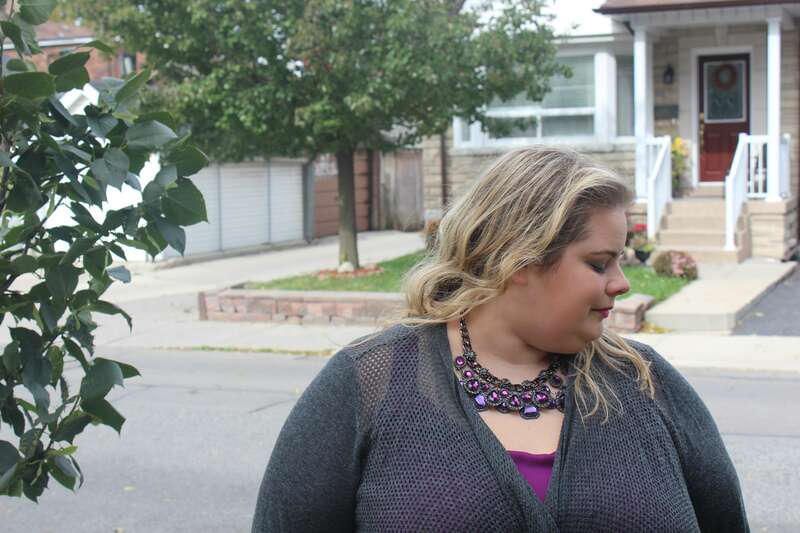 My layering piece is my absolute favourite cardigan that is also a 6th & Lane piece from last fall. I love the texture in this and the fact that it is light weight and partially see through so the colour of the tank comes through beautifully. It has great versatility with the ties at the waist and looks great, open or closed. Now I know this is not available, but I provided links to a couple of great alternatives. 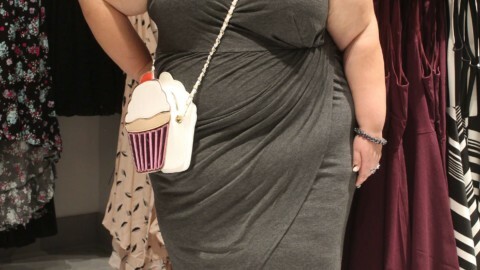 To accessorize this look I added this necklace from Torrid. I am so in love with this piece. The purple matched perfectly and I love the antique like quality that it has. 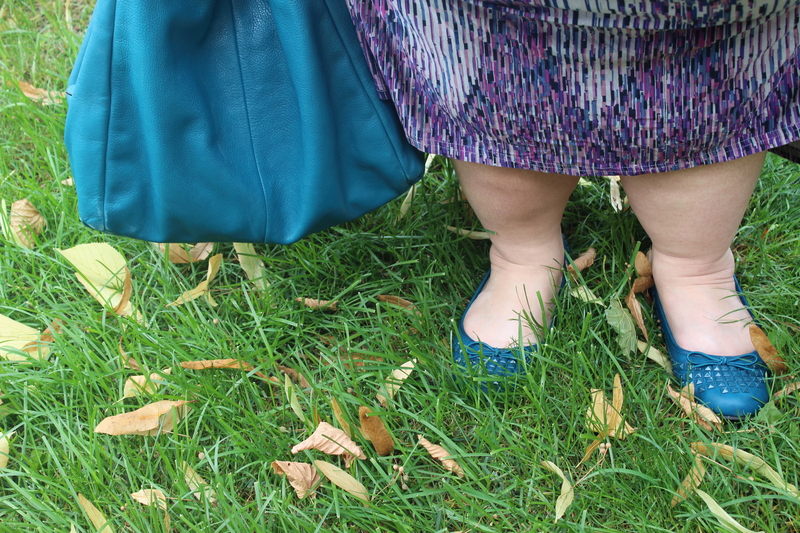 I then added my teal flats, also from Torrid, perfect for a long day at the office or an afternoon out on the weekend. 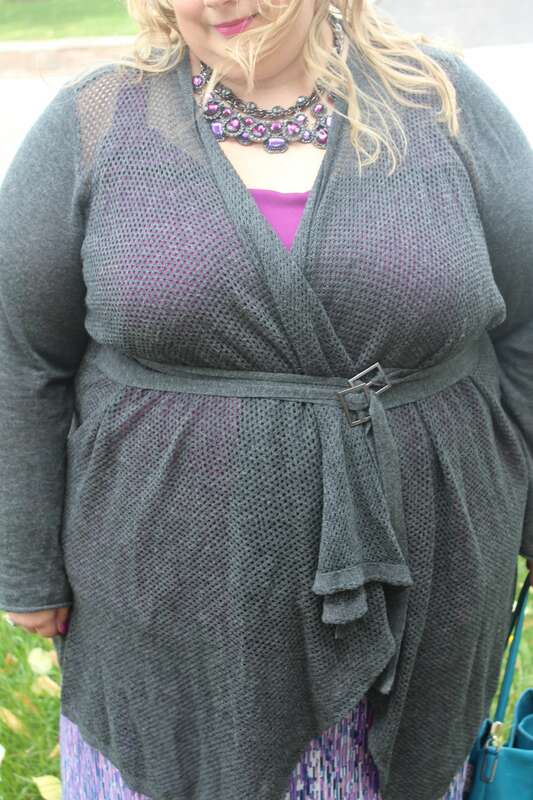 I wear a size 9 in Torrid shoes and find the fit pretty consistent. I love the added touch of the studs. My bag is a classic Phoebe style from Coach. The Phoebe is still available in Coach outlet stores in a wide array of colours but in the retail stores it has received a modern update and is now called the Edie. I love the versatility of this bag, it is a great every day shoulder bag. Well I am off for another busy day of work and adventure, till next time everyone! Thanks to my boo Thera for the beautiful pictures! Torrid FAQ – Get Your Answers Here! I love dresses and skirts, so easy to put on over your head in the morning …. but only if I don’t have to do a lot of walking b/c then I get chaffing in the thighs. Do you have this problem? Do you wear something underneath? I live in my spanx equivalent! I have a couple of pairs that are not tight and uncomfortable but just prevent chafing and smooth things out. I got them from Penningtons.